The Smitty Place- family friendly and plenty of parking! Spacious & sunny, The Smitty Place is a great home base for your McCall adventure! This 4 bedroom home is in a quiet neighborhood, close to town and shops, and just a short hop on to the city bike/walking path, which is plowed in the winter for year round access. With an open floor plan, plenty of off street parking, use of single car garage, and a large well-designed kitchen loaded with counter space, The Smitty Place is perfect for larger families and groups! Bring your toys and trailers - there is room to park your toy hauler and boat trailer plus cars on the driveway. HUGE entry and mudroom area gives you a place to store your gear and toys AND includes 3 bikes for your use during your stay. Cable TV, WiFi, and an upstairs entertainment area with combo pool/air hockey table makes sure everyone in the group has space to relax or be entertained. The main floor of The Smitty Place includes kitchen with high end kitchen appliances including a wine fridge, 36 inch Dacor Dual Fuel Stove, and two sinks for easy prep. There is also bar seating for 4, dining nook with seating for 6, the living room with Cable TV and propane fireplace, 1 queen bedroom, 1 bunk room with a twin over full bunk bed, and a full sized bathroom with double vanities. Also accessed on the main floor is the laundry room, located in the garage. Upstairs you enter the loft entertainment area with a large TV and movie watching area with oversized leather couches and a combo pool/air hockey table. Through the entertainment area is 1 queen bedroom with a private balcony, 1 king bedroom with a large walk in closet and plenty of space for a portable crib, and a newly remodeled bathroom with large tiled walk in shower and double vanity. The small backyard deck includes a brand new large propane BBQ, fire pit, and room to play! 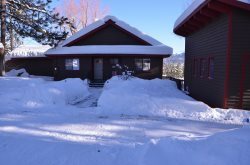 The Smitty Place included use of a single car garage only available in the months when there is no snow (one bay is reserved for owners) and the large driveway provides plenty of off street parking for your vehicles and toy trailers. Ample space for boat and snowmobile trailer parking, plus your rigs! The Smitty Place is 2,400 sq. feet and sleeps 9 in beds. Garage use for vehicles only in the months when there is no snow.